I hope I’ve made it clear how much I love my freezer. I’ve recently been on a chicken drumsticks kick. I keep finding them at different stores for GREAT prices. I’ve been making our favorite 20 to 40 clove garlic chicken recipe one night and the second night either making Ally’s stir fry or my chicken and rice soup. The Huzz recently remarked how much more flavorful this chicken meat is compared to when I simmer chicken breasts and cube them for future freezer meals. Yesterday I found two more good deals on drumsticks. (Not as good as this deal, but 99 cents a pound is not bad.) 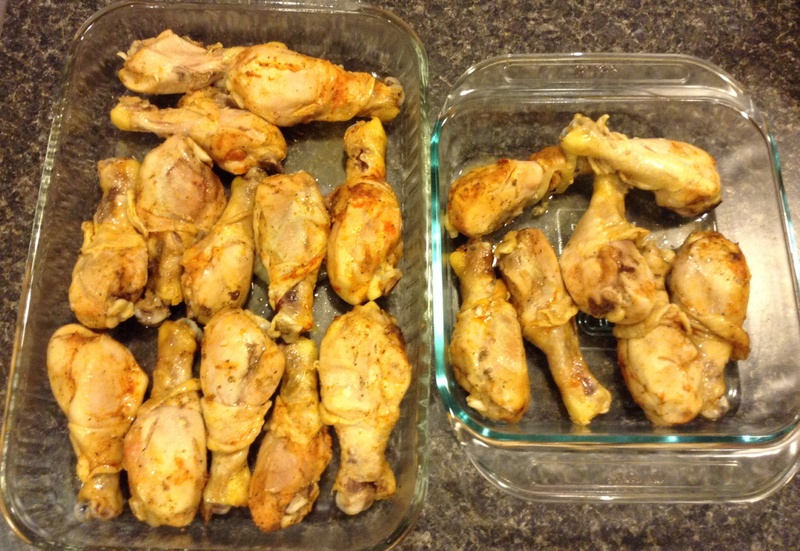 I made a big batch of drumsticks and tonight I portioned it all out. Here’s the link to my favorite drumsticks recipe. Here’s how much chicken I ended up with for $5.35. And here’s how yummy it looks! Then I portioned it into 1 cup servings. I bagged each one individually and then put them all in a gallon ziploc freezer bag for extra protection. I don’t want my hard work to get ruined with freezer burn!! 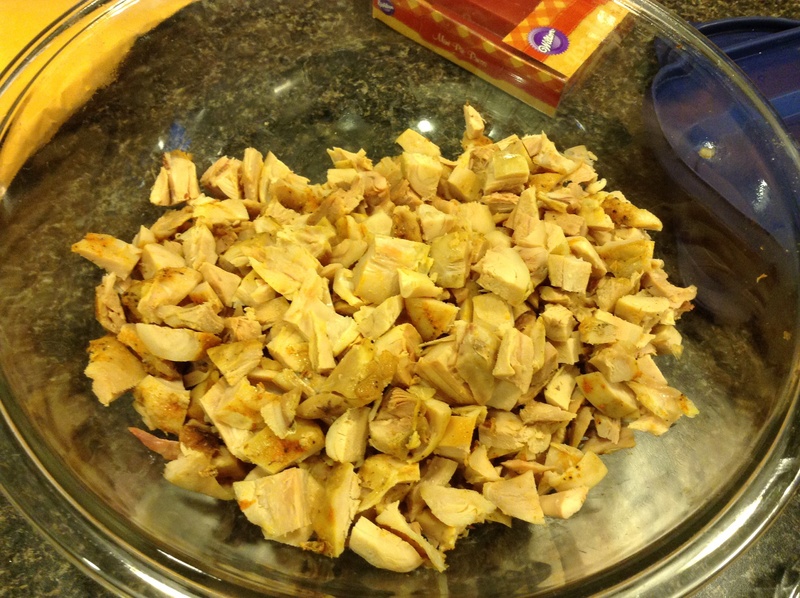 I ended up with 6.5 cups of portioned and chopped chicken. That’s 82 cents per meal for the chicken! Hollah!!! Be on the lookout for a future post about what to do with all of this yummy deliciousness!! Today, I’ve felt a nudging. A tug to sit and let my fingers flow across the keyboard. I’m not sure exactly what I’m going to write. But I’ll tell you it will be about God’s faithfulness. For my bible study, we’ve been reading God As He Longs For You To See Him by Chip Ingram. 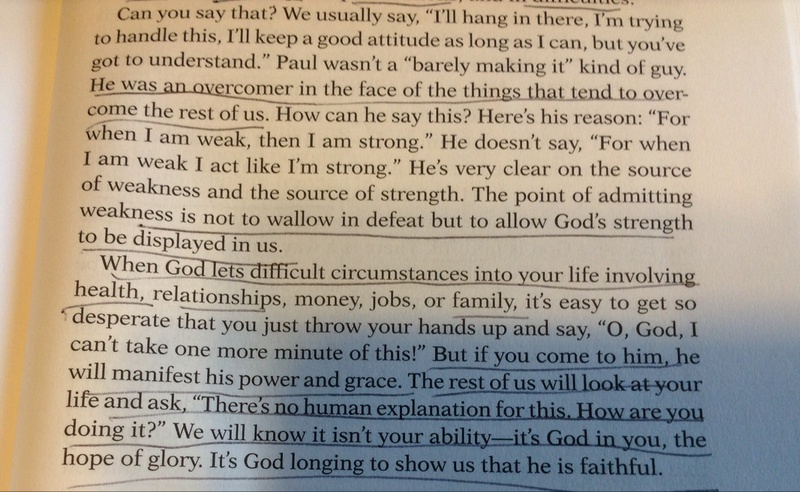 I’m on the last chapter, “The Faithfulness of God” and I’ve been underlining a lot of sentences. I can tell you we beat infertility the first time. We have a beautiful little toddler. She’ll be three on Thanksgiving this year. We have much to be thankful for. She is our little joy, a precious gift from God. And a living, breathing, walking reminder of God’s faithfulness. Thank you Lord Jesus, for the gift of my daughter. She is an everyday reminder of Your faithfulness. When I was lost in the grief of infertility, You knew that my heart would one day be filled to overflowing with the precious child You would give us in Your very perfect timing. It helps me to remember God’s faithfulness every time I tell SG her/our story. God is so faithful. He is so good. I may sometimes get caught up in emotions, but this remains true. God was faithful to our prayers. For number two, we tried again with the doctor’s help. We did not get pregnant. I know that God is faithful. I have to trust Him and His plan for our family, whatever that may be. Whether or not we ever have another biological child or not. Whether we feel The Lord leading us to adopt or not. Recently, SG was at a salon getting her hair cut. The hairdresser innocently asked SG if she had a brother. SG looked at me through the mirror with huge eyes because she didn’t know what to say. I shook my head no, and she said “No.” The lady then asked if she had a sister. Again, the huge eyes, a shake of my head no, and she replied “No.” I don’t know why this turned my heart and squeezed it so tightly. As I felt my stomach drop, my daughter exclaimed, “But I have Hunter and Logan!!! !” with a triumphant smile on her precious face (my nephew and niece.) SG lifted me out of my little state of sorrow with her sweet heartfelt response. Just like with our food allergies, sometimes I want to shout, “I didn’t choose this! I want more children! I don’t want to deal with infertility, painful emotions linked to innocent comments, strange looks when doing stuff for our food allergies, a different lifestyle to keep our child safe, etc.” Yet, The Lord has allowed it. And through it all, He’s faithful. Lately, when the mention of food allergies and living a dairy and egg free lifestyle comes up, people have lots of questions. I’ve felt convicted. I need to give God the glory. To proclaim His faithfulness in these trials. For His provision of supportive friends and family and knowledge to keep my child safe. In his financial provision because our diet is not cheap. Quite expensive, actually. Faithful to provide friends to stand in the gap. To love on us. To take extra steps to make us feel loved. Faithful to provide a local food allergy support group. People who live in my town who understand what it’s like to live with life threatening food allergies. Friends who have gone through infertility. Friends who understand the ache of empty arms. Friends who have overcome infertility. Family and friends who love me when they’ve seen the worst of me. In His provision to give me a husband who has stood by my side for eleven beautiful and messy years. Faithful to give me a beautiful, “fearfully and wonderfully made” precious little child, my SG. God is so very faithful. All the time. Remembering God’s faithfulness has helped me so many times. Until next time, my friend. I recently bought a five pound bag of russet potatoes from the grocery store for 99 cents! Y’all know I like to make my dollar hollah! 🙂 I couldn’t resist buying these. The Huzz smiled when I showed him my good deal, knowing what the outcome would be. I’d use one potato and forget about them, eventually throwing the entire bag away. I was DETERMINED that this time I’d use every single potato in that bag. And I’m proud to say that I did. Here’s one of the ways I used those potatoes- twice baked potatoes! I used several different recipes I found on the web as a guide, but in the end, I adapted and it turned into my own creation! 1. Preheat your oven to 425 degrees. Line a baking sheet with foil. Rinse, dry, and prick your potatoes with a fork. Bake for 1 hour. I didn’t let my potatoes cool too long because we were hungry. If you plan better than me, let them cool some before handling. 2. Cut the potatoes in halves. Use a spoon to scoop out most of the insides, but leave enough of a “wall” of potato so that it doesn’t collapse on itself. Put all of the scooped insides in a bowl. 4. Place the empty potato halves on a foil lined baking sheet. Fill with the seasoned potato mixture. Bake at 350 degrees for 15-20 minutes. I did 15 minutes and my potatoes were perfect. I ended up with 6 potato halves and we gobbled them all up except for one. I froze that half and will pull it out one of these days and see if it stood up to freezing. 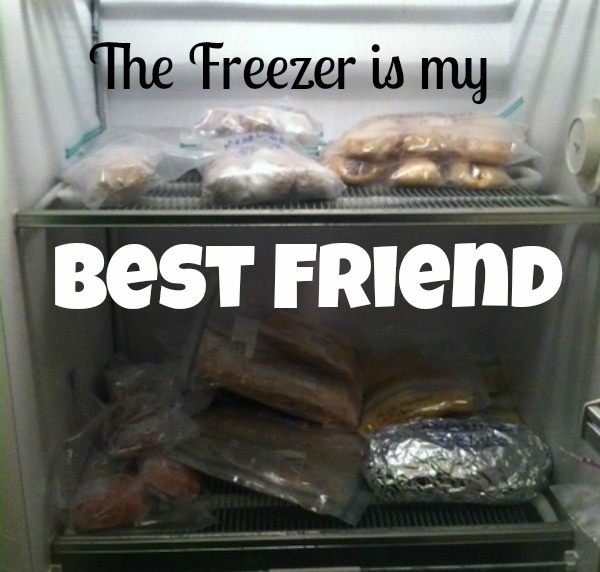 Because y’all know how much I love my freezer! Lately, the Huzz and I have been discussing ways to make our diet healthier. I cook a lot from scratch, but we have discovered more and more processed convenient foods that we never knew were safe for us! This has led to our enjoyment of processed foods again… maybe a little too much. Don’t get me wrong- I don’t think suckers and Oreos are evil. I’m SO happy my little one can eat some “safe and normal” treats. But I have been thinking about ways to make our diet healthier. Today I found organic, grass fed sirloin steaks on SALE! I thought back to our conversations, and decided to attempt some sort of a steak salad for lunch, as we had bought some fresh spinach last night. 1. Season steak. 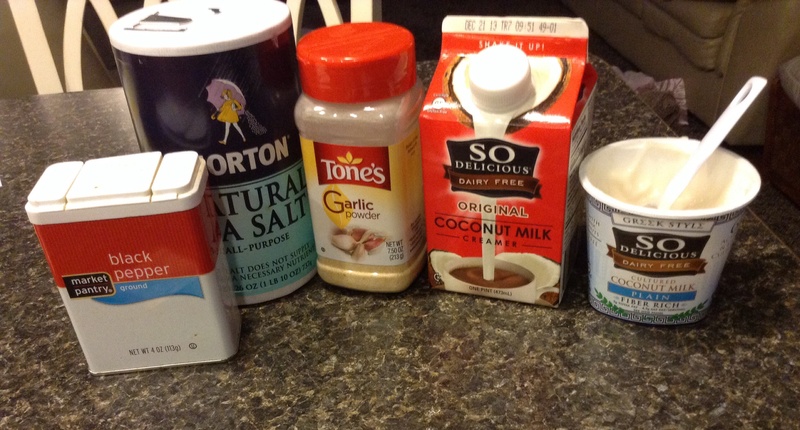 I used soy sauce, garlic powder, onion powder, oregano, salt, powdered ginger, and Adobo. 3. Cook steak to desired doneness. 4. 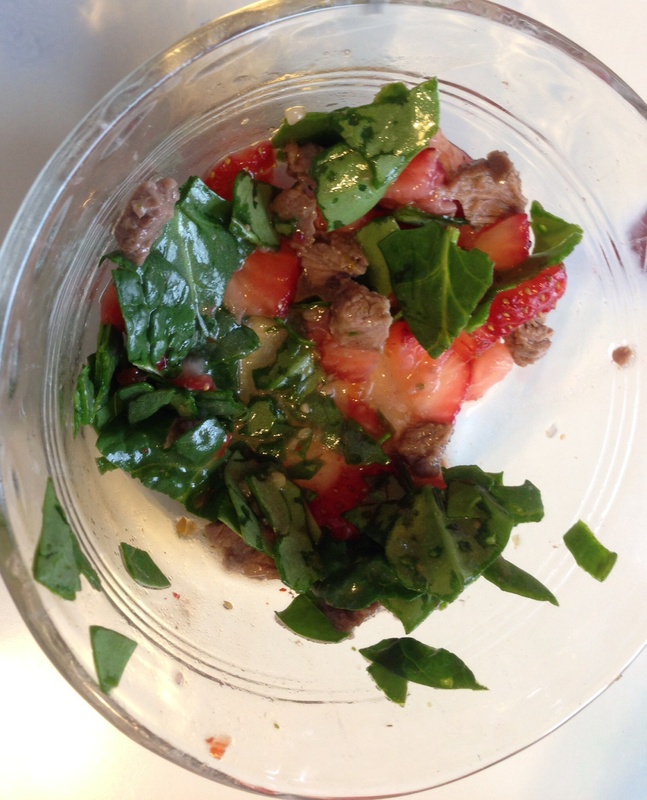 While the steak is cooking, prepare the spinach leaves and strawberries. Put in bowl. 5. Cut up steak. 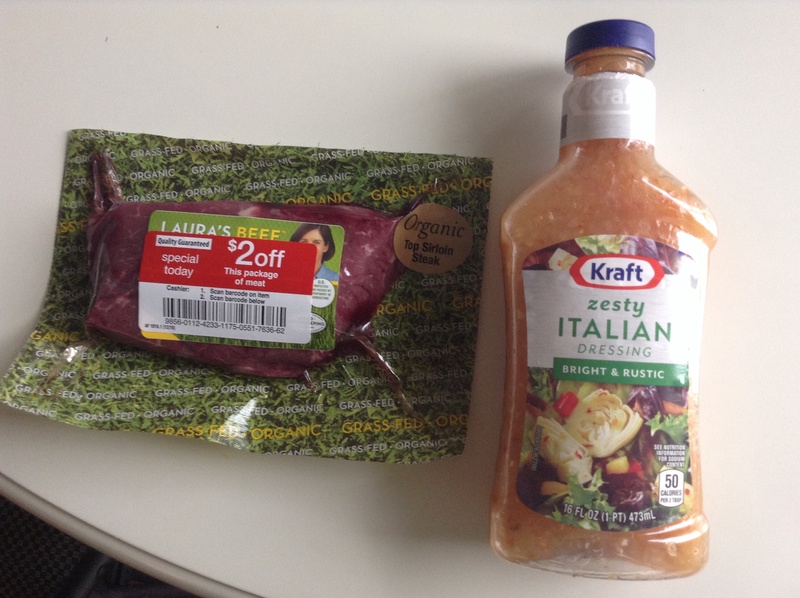 Mix steak in with salad. Toss with a small amount of Zesty Italian dressing. Side note: I mixed in SG’s steak in her salad. I personally like to leave my steak on a separate plate because I like the flavor of the steak and don’t want it get lost in the Italian dressing. I still use the Italian dressing on my salad, if that makes sense. My sister suggested sliced almonds as an addition to the salad. Do whatever floats your boat! Here’s the pic of SG’s little salad I snapped at the last minute. 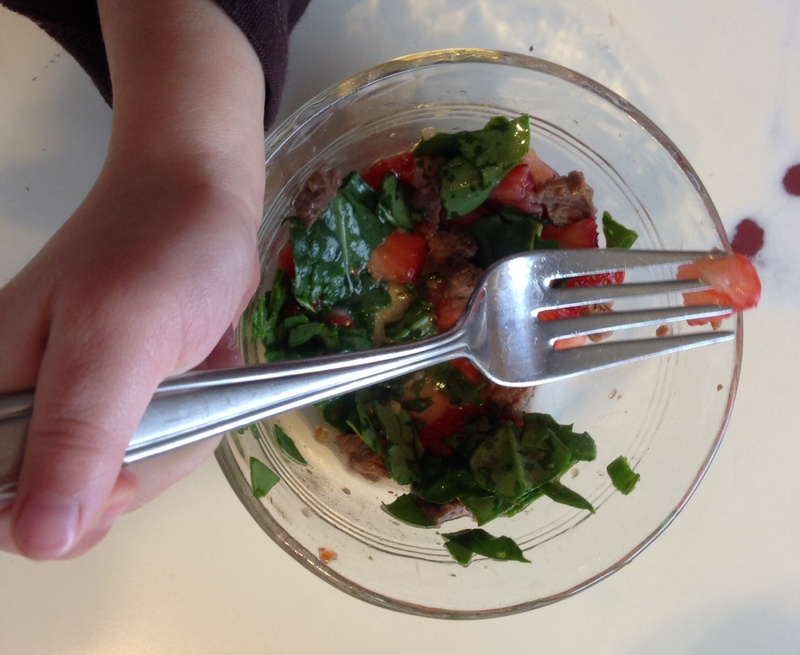 As she kept exclaiming she loved steak salad I decided this was blog worthy. Not the most beautiful photo, but hey, who cares? She ate a healthy lunch and LOVED it. That’s what counts! I had to include this one because her precious little hand made it into the photo.